Krakow, Poland. 3rd June 2014. 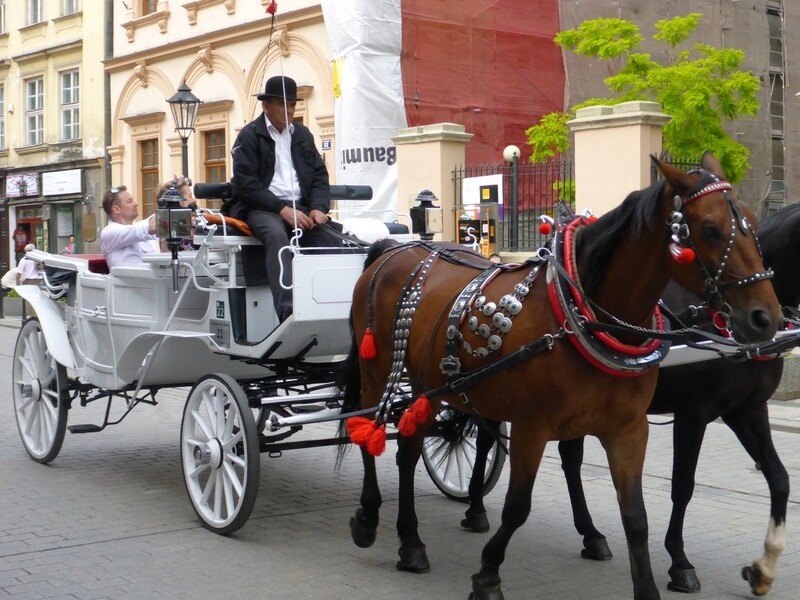 The Medieval city of Krakow is definitely one of the jewels in Poland’s crown. Most of the original buildings from these times still stand, ready to welcome visitors. 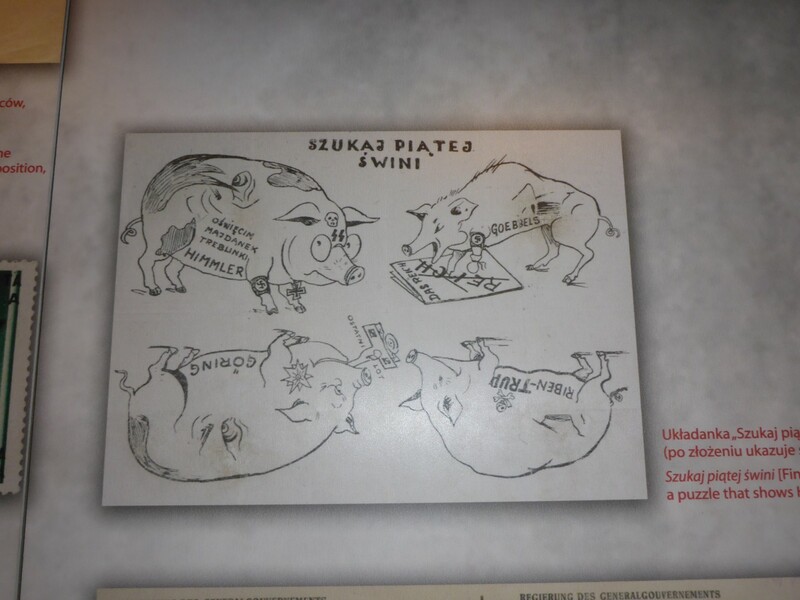 However, before delving into the town’s historical delights I had plans to delve even deeper with a visit to the Wieliiczka Salt Mines. Located about 15km from the town, the mines have been a major source of income for the area since the first shaft was dug in the second half of the 13th century. Seven hundred years later the mine is no longer economical and is, instead, a major tourist attraction. Although there are still 300 miners employed there on safety work they are outnumbered by the 500 guides. 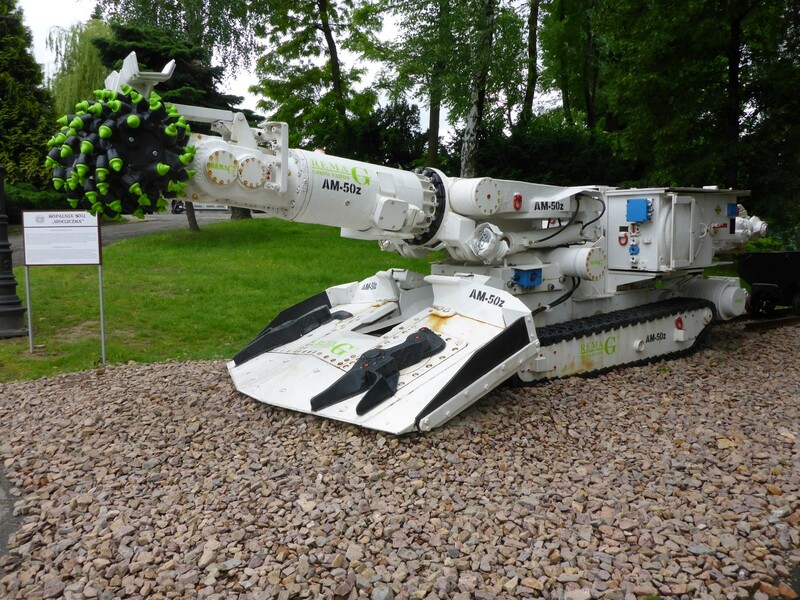 One of the rock cutting machines, in use until the mine stopped production. Neolithic man used to get salt from the area too but only by boiling water from briny pools to extract it. The only digging they did was to find more water. These mines were a far more series enterprise and the salt brought up was 70-90% pure. The mine has over 280kms of tunnels and over 2,000 chambers that have been dug out. They are often huge in size, being 30, 40m or even 50 metres high. Some of these contain displays showing how the miners worked and the equipment they used. Others have been given over to very clever and artistic rock salt carvings. Many of these have a religious theme, others a classic one. Poles are, or were, a very religious people, the miners perhaps more than most. I suppose when you’re working under those conditions you probably reckon that help from any quarter can only be good. For this reason there a several chapels among the chambers. 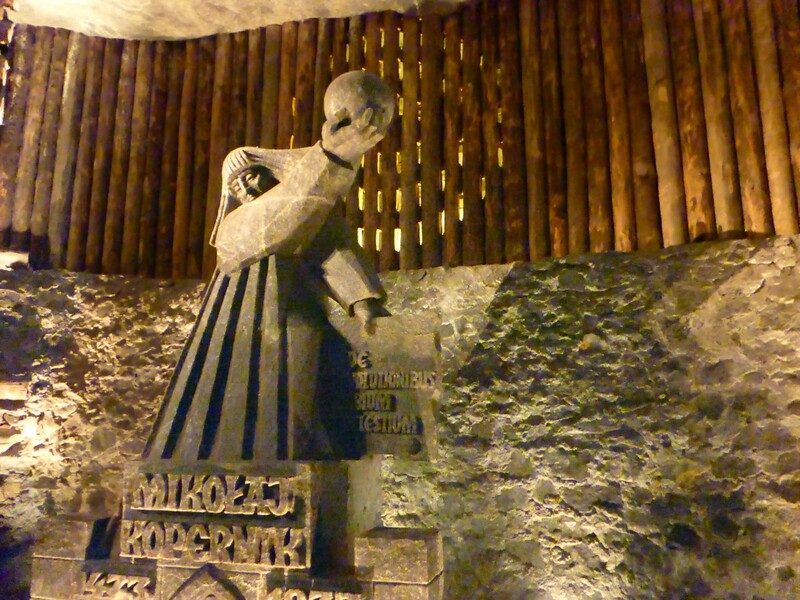 Pope John Paul II visited at least twice before he became pope. Other chambers have carvings of important Poles – rulers, company directors, famous people including, of course, John Paul II. 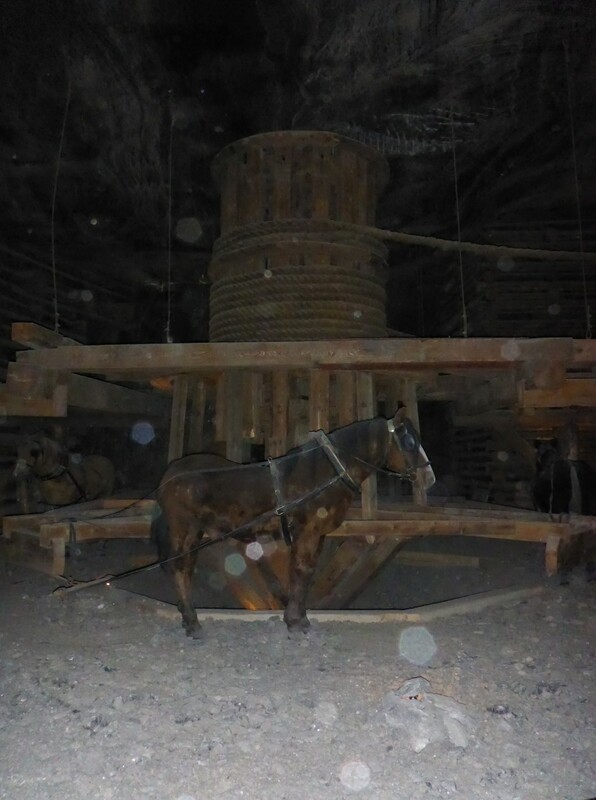 Over the centuries the mine has been a constant attraction for tourists. Copernicus visited several times and it has been very popular since the 18th century. The stairs seem to go down forever. Part of the old winching gear. One of the toughest jobs was that of burning off the methane gas released during the digging. 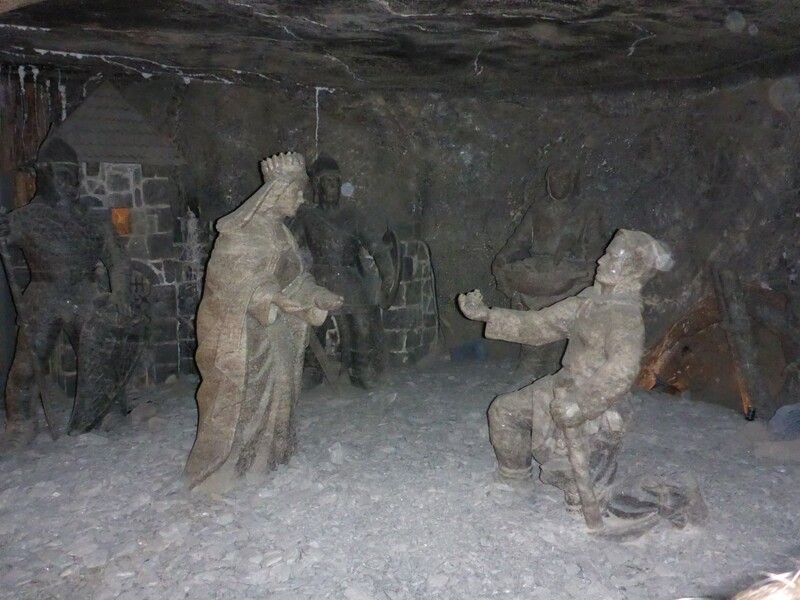 The miners only had candles to work with and the fear of explosions was as great here as in any other mine. Men were specially employed for this task. They wore very heavy clothing, soaked in water, and would crawl through the mine, protected by wet blankets, deliberately setting off the gas. The guide was very good and there was a music and light show in one of the highest chambers where there is also a lake. Another chamber had a nice, cheap restaurant for visitors which I had no problems with taking advantage of. There is a chapel and function room that can be hired out to the public. Beats a stately home in my book! 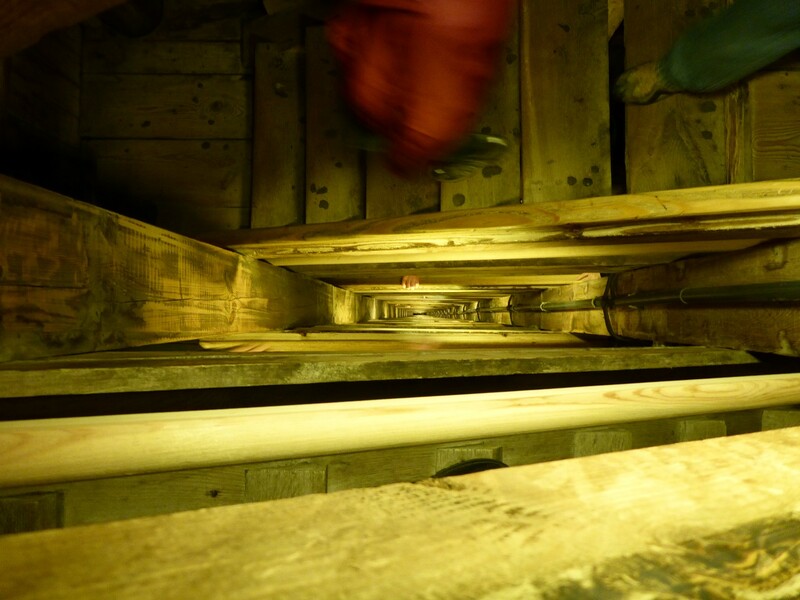 Having climbed down 378 wooden stairs to get 64 metres down into the mine and walked the 3km tour route, I was pleased to see there was a lift to take us back up. It was a very interesting place to visit and it’s strange but also comforting to think of the same activity going on in the same place for so long – over 700 years. Back on the bike for a wet ride to Krakow and, as it was on the way and I had time, a visit to the Schindler Museum. I imagine most people have heard of, if not seen, the film Schindler’s List. It tells the story of German factory owner Oskar Schindler who, very much against type, decided to help over 1100 Jews escape the gas chambers by using them in his factories and protecting them from the SS as much as was possible. The museum tells how he was not a Nazi but had been a member of a political party that was absorbed into theirs. He was a bit of a rake, liked the ladies and knew all the right people in the local party. Not the type to be rescuing Jews you’d have though,t but when the time came he stood up to be counted and the result is history, as well as a damn good film. I’ve quoted the Wikipedia entry below as I think it tells the story succinctly. The Schindlerjuden, literally translated as “Schindler Jews”, were roughly 1,100 Jews who were saved by Oskar Schindler during The Holocaust. They survived the years of Nazi regime primarily through the intervention of Schindler who found them protected status as industrial workers, and after 1944, in an armaments factory in occupied Czechoslovakia. They avoided being sent to death camps and survived the war. 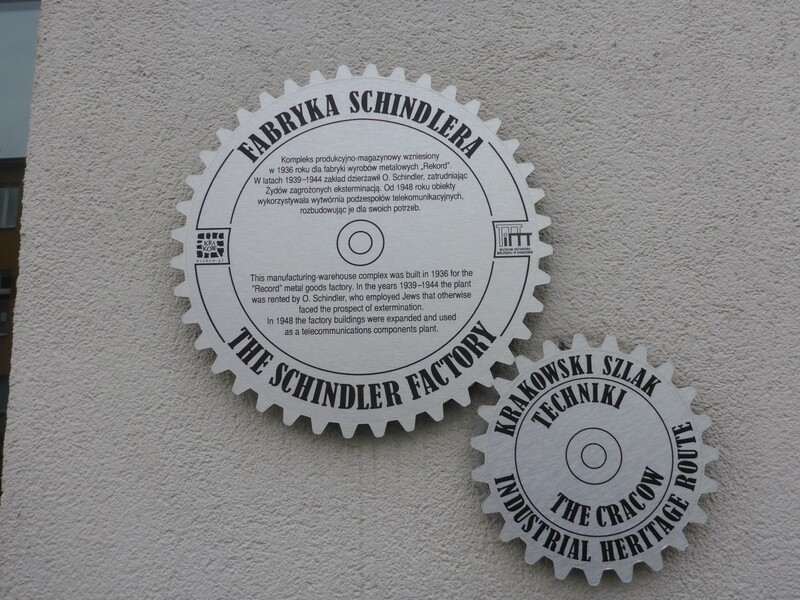 Schindler expended his personal fortune as an industrialist to save the Schindlerjuden. In 2006, there were estimated to be over 7,000 descendants of Schindler’s Jews living in the United States, Europe, and Israel. I think the last sentence is the telling one, showing the ongoing benefits of one man’s actions. The museum also points out a couple of inaccuracies in the film but who cares? It’s a great story. I’ve seen the film and would recommend it. One of the Schindler factories. 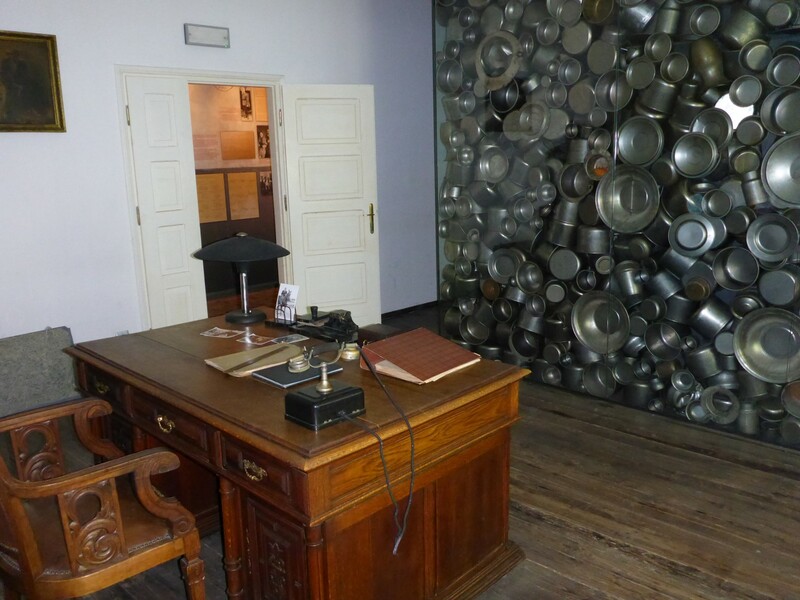 His secretary’s office, with a display of some of the enamel cookware made in the factory. 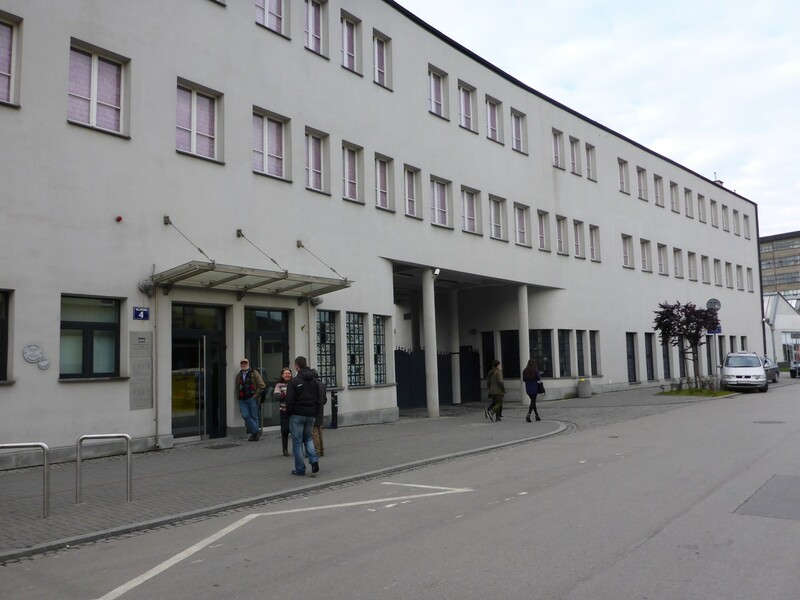 Although the museum is in one of Schindler’s former factories, his story does not occupy the greatest amount of its space. 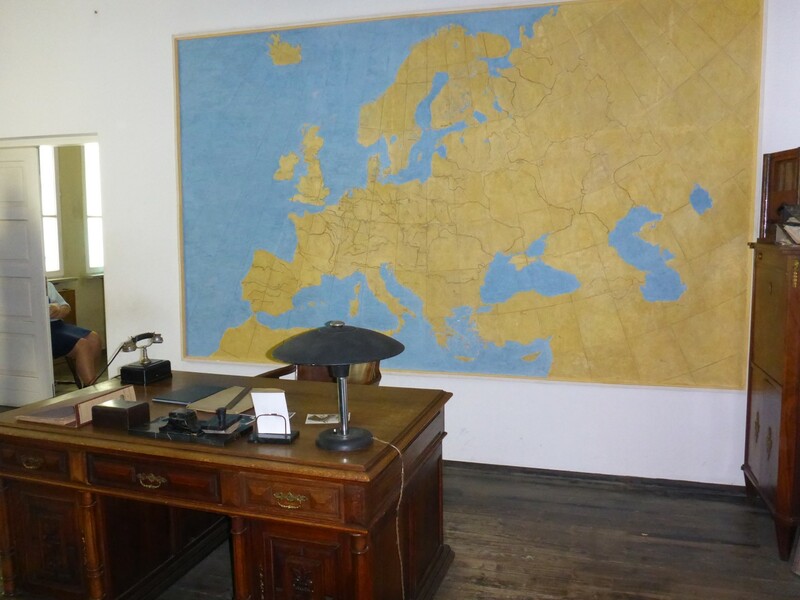 His old offices are where I saw his story but the rest of the building is given over to a display telling what happened in Krakow during the German occupation. And it doesn’t make pleasant viewing. Krakow suffered almost no damage during the war. Essentially if you were a building you were OK but if you were a Pole then life was very tough indeed. The Polish people were, in effect, a slave labour force. Many were sent out of the country. Poles seemed to have suffered a much harsher rule than some other countries but I suppose that’s relative. Many ‘crimes’ were punishable by death, such as black marketeering or hiding Jews. Other misdemeanours led to prison sentences. There was a tough rationing regime and food was scarce. There was never enough to eat especially for those who had to do manual labour. Krakow was the HQ of the Polish German Government so security was tight. But the Polish Government had never surrendered and set up its operations in London from where it made the resistance movement as much of a thorn in the Germans’ side as possible. The Jews were forced out of their homes into ghettos from where they were sent to the death camps in August 1943. 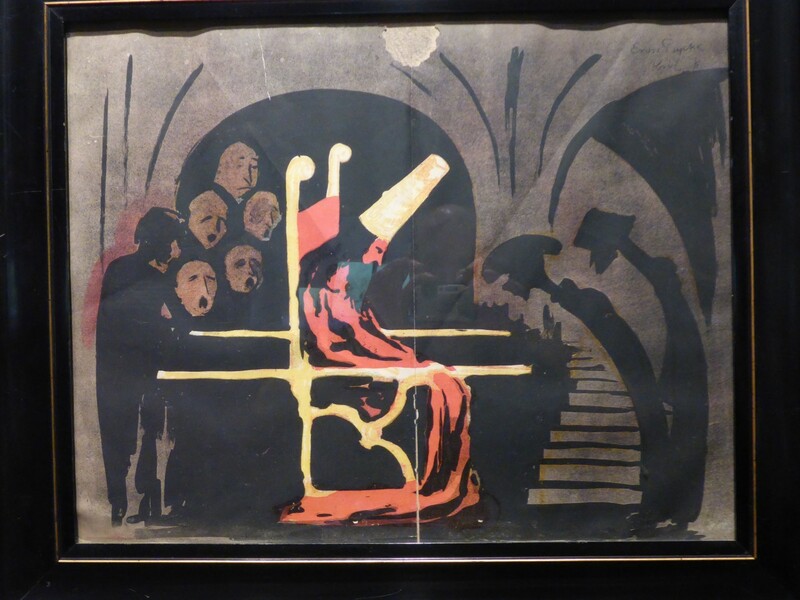 The displays include photos, mock ups of homes and hiding places, Nazi proclamations, always bringing bad news and stories of resistance to the regime including those of people brave enough to hide Jews. Some of it was very moving but it seemed to me to reflect the story of many Polish and other eastern European cities during those awful times. It was well worth seeing and gave me much to reflect on. Leaving there I headed back to the hostel. I’d changed hostels from the one I was in at first as I had only booked two nights there and they didn’t have room for me when I decided to extend my stay. I didn’t mind, partly because the new one had a courtyard out the back and a passage running to it from the street. It meant I could leave my bike in the passage, out of harms way unlike at the other one where I’d had to leave it in the street. Not very good for peace of mind. Unlike in hotels, in hostels you do seem to see human life a bit. In my dorm was another man and a woman, probably in her forties. I had said Hello to her and just about got a reply but what struck me as weird was that she slept fully dressed. I saw her at breakfast one morning wearing exactly the same as she’d gone to bed in the previous night. I’d have loved to have asked her why but she wasn’t very communicative. I just dubbed her ‘weird woman’ and left it at that. 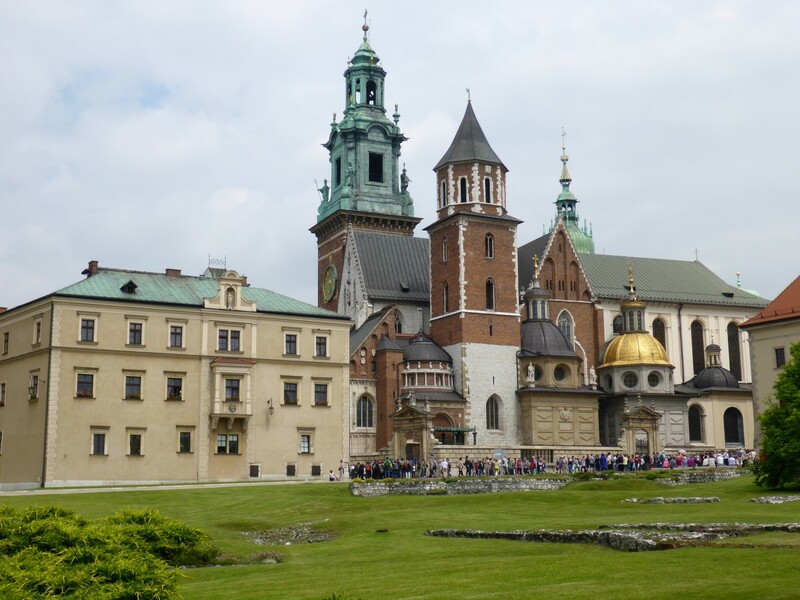 During the next couple of days I planned to tackle historical Krakow so before I take you there, a bit about its history. The city dates back to the 7th century and became Polish in the 10th when the first Polish ruler, Mieszo 1, took it from Bohemia. In 1038 it became capital of Poland and remained so until 1569 when the capital moved to Warsaw under the Swedish King. 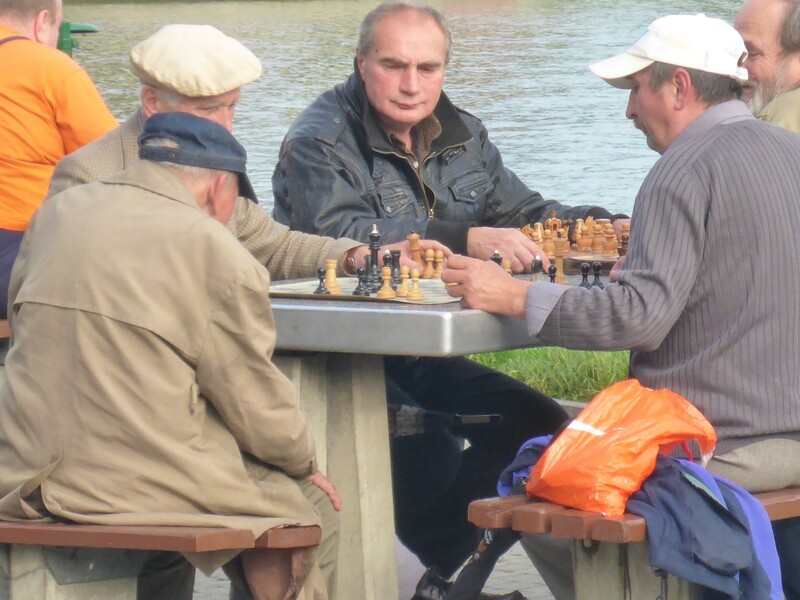 It sits on the banks of the Vistula River and is on an important trade route to Hungary. In the 13th century the city was attacked three time by the Mongols although they were fought off on the third occasion. From then on the city prospered, based on trade, with the Polish rulers allowing tax breaks to encourage it. The city rose to prominence in 1364 with the founding of Krakow University, the second oldest in Central Europe after Prague’s Charles University. 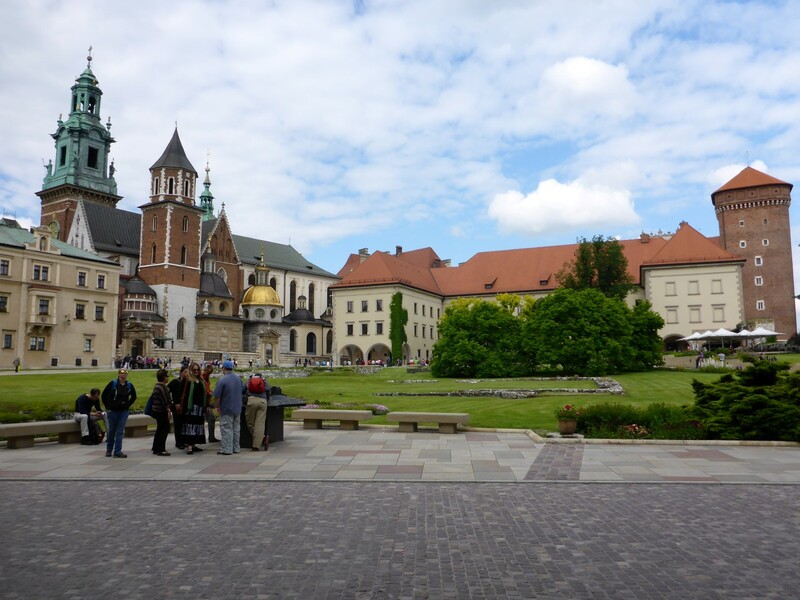 If the crown of Poland rested in Krakow then one of its jewels must surely be Wawel Castle. In the 11th century the city had many brick buildings constructed, along with fortifications and the castle. Sitting on a limestone outcrop above the river, the castle is as impressive as any you’re likely to see. It incorporates a cathedral and a basilica as well as a residential section of Italianate design. 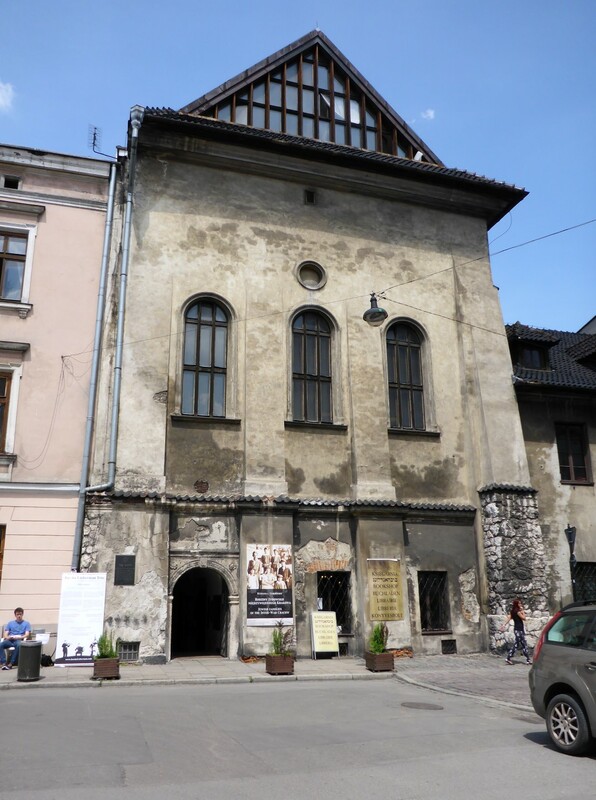 One of Krakow’s suburbs, Kazimierz, was home to the city’s Jewish population and one of Europe’s oldest synagogues still standing is there, built in the 15th century. My hostel was only a ten minute walk from the castle so that seemed to be the best place to start. There was a menu of entry fees to choose from ,depending on what I wanted to see. 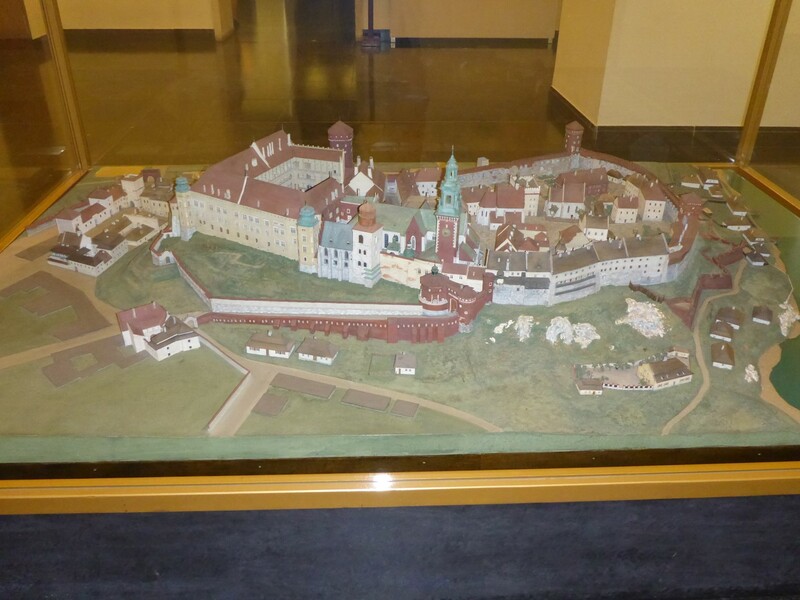 I settled for Lost Wawel – a look at the ruins and artefacts of the original 10th century castle that had been built over; the State Rooms – an exhibition of how it was in the 16th and 17th centuries; the Royal Private Apartments – the former apartments of the Royal family, suitably refurbished. The visit to the State Rooms was timed so as to prevent overcrowding and the Private Apartments included a guide, always worth having in my experience. One of the bugbears of some places is that you can’t take photos and the tours were like this. Even the ruined foundations were a photo free zone. Why? You tell me because I don’t know. Wawel castle from across the River Vistula. As hinted at, the original castle was built over when the town became a Bishopric and the cathedral was built too, around the year 1,000. 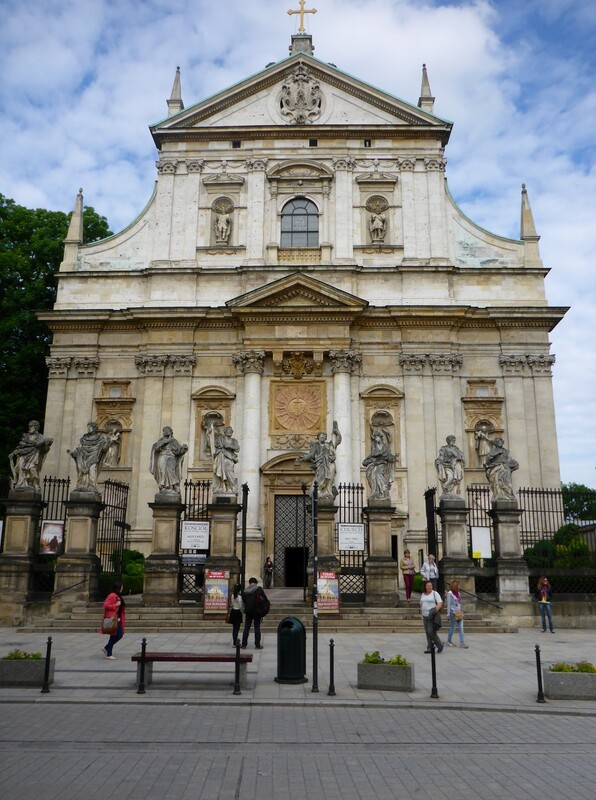 Both buildings have been altered,improved and added to over the centuries particularly in the 16th century when a large Renaissance addition was built as a palace for the Polish kings. Even when the capital was moved to Warsaw the castle was still the site of all coronations and burials for the kings until the demise of the Polish crown in 1795. There is a Coronation Road running down through the old town to the castle. 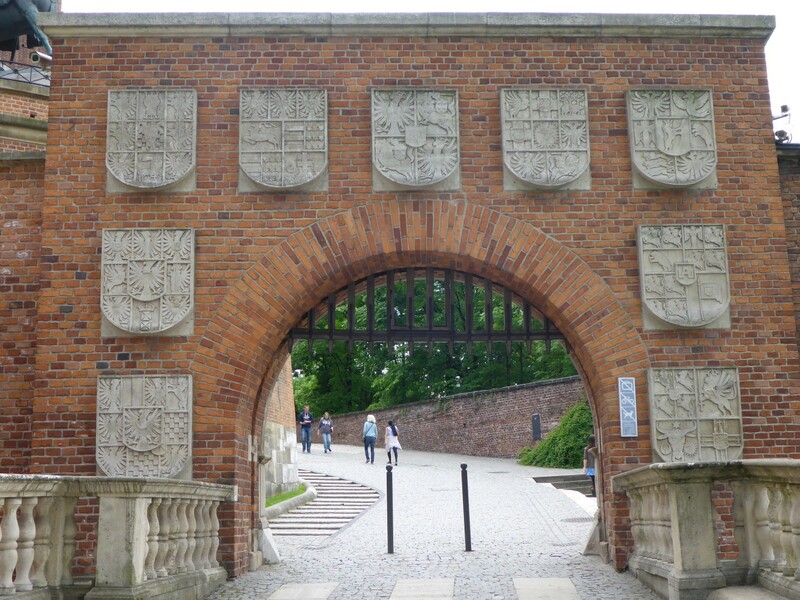 When Poland was invaded and partitioned the castle became a barracks for the Austrian army who caused much damage to the interior decorations. When Poland became a republic after WW1, the castle was refurbished and became the presidents’ residence. Model of the castle complex. I paid for an audio guide, always worth the money, and walked around the grounds and exterior parts of the castle until it was time for my visit to the Private Apartments. The decorations have been restored in these rooms and they are well worth seeing. No photos, as none were allowed, but they follow a not uncommon pattern of having very expensive wallpaper, furnishings to match and pictures hung as extra decorations. The rooms are often themed, either by colour or by topic. The topic will often be successful battles, with paintings to match and these have a historical value in them selves sometimes, providing a surprisingly accurate record of events. Of course, you only ever see the wins, never the losses. A common feature of Renaissance castles seems to be the layout, in that there is usually a throne room and salon or ballroom for big occasions and then his and her apartments coming off them along separate wings. There will be formal rooms for public visits, less formal rooms for private visits and then private rooms, such as dressing rooms and bedrooms. These are often interlinked with passages behind them for servants etc. One major problem exists with the renaissance design of this palace. Having been designed by an Italian he forgot to consider the Polish winter and its minus 20 degree temperatures. So in some cases getting from one room to another involved walking along the freezing balcony. I had a small chuckle at this. Who’d be a royal? The cathedral attached to the castle. The State Apartments biggest draw must be the tapestry collection commissioned from all over Europe by King Sigismund I, the Jagiellonian Tapestries. There were 300 of them of which 138 still survive, some having been sold off by a later king to pay Poland’s debts. But mainly they survive because of some smart moving just before the Nazis arrived in 1939 when the tapestries were shipped to Canada via Romania, France and Britain. They left the castle only two days before the Nazis arrived there and crossed into Romania along with fleeing refugees. Genuinely in the nick of time. Once in the UK they were sent across the Atlantic in a convoy of ships, many of which contained European treasures sent to North America for safe keeping. At that time nowhere in Europe was considered safe, including Britain. Many of the tapestries were on display and the quality of them has to be seen to be believed. They have huge amounts of gold and silver thread in them , which can be seen clearly. They have survived the passage of time remarkably well and the colours, although faded a bit, are still very good. The artistry is really top notch with a spectacular range of expressions on the faces and a graceful quality to the movement of the animals. The subject matter ranges through religion, classic stories, hunting, battles – just about everything. There is a large art collection in the castle, including a Guttenburg Bible, and many other masterpieces. The original entrance arch with coats of arms. One thing to remember about Polish kings is that they were elected by the nobility which meant that foreign candidates could apply. This is why a Polish king was also the Elector of Saxony – Sigismund 1 for example. Once appointed, the position was held for life but was not hereditary. Whether this was better or worse than other systems is not for me to say but I wonder how it would go down in Britain if such a system were suggested – former Prime Ministers excluded of course! I’ve already described the Private apartments but it was very good to have the guide who was able to explain everything and also reveal some of the stories behind the throne, as I’ve just related. I spent some time walking around the grounds, listening to the audio guide and just as I had finished the battery went flat on it. Good timing on somebody’s part. I did have a look inside the cathedral but they wanted more money to go right in and I got an impression that it wasn’t any better than I’d already seen, so I passed. My final visit was to the Dragon’s lair, which is a cave in the limestone rock that the original castle was built on. Legend has it that a Dragon used to live there and capture fair maidens until some bloke on a horse killed it with a lance. I wonder who that might have been? There’s no question that this castle, as well as having a very interesting history, is also a spectacular site to spend time in. Fascinating and educational, it was definitely money and time well spent. The best view of it is from across the river from where it glows warmly in the afternoon sun although it must have looked pretty fearsome to an approaching enemy. Walking up the Coronation Road in the reverse direction to that of the Kings, I headed for the old town. This part of Krakow is probably unique in that the Old Town is an area that is self contained and separate from the areas around it. To the north it is guarded by the old fortifications and down each side has been built a kind of green buffer zone of gardens which keeps it separate from the surrounding busy roads. This makes the Old Town area very peaceful and completely unspoilt my the usual modern intrusions. The architecture within dates from the 14th century and the Cloth Hall is Europe’s oldest and biggest. It is completely original and is still used for its original purpose of trade, although most of it is tourist ‘artefacts’ (tat). The nature of the old town is such that the oldest architecture sits in the middle and then radiates outwards as the years went by so the buildings there represent the growth of the city and the changes in architectural style. There are a couple of churches in there too along with a Town hall. It was late in the afternoon by now so i didn’t delve too deep as I wanted to get back to my hostel and eat. All this sightseeing is hard work! One of the many churches in the city. 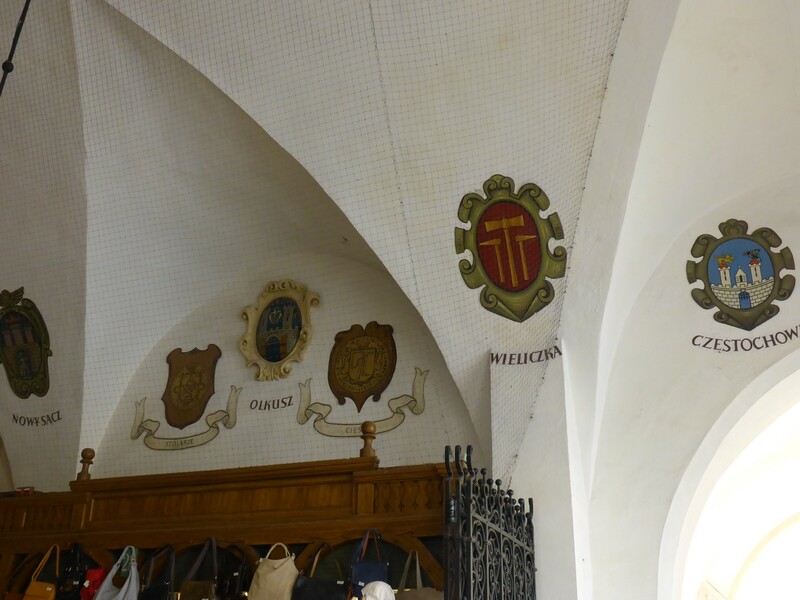 Some of the trades’ guilds badges inside the hall. 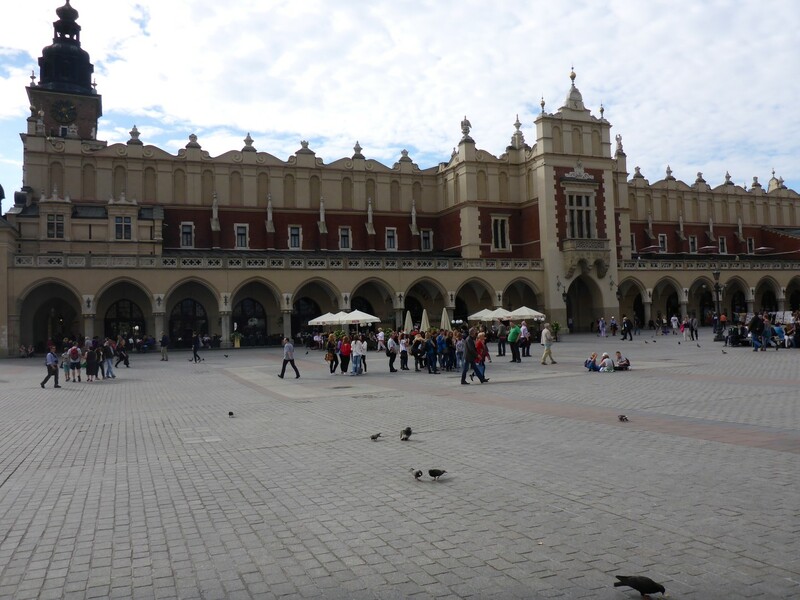 A few photos of some things to do on a sunny afternoon in Krakow. Get taken for a ride. Next day I continued my exploration of Krakow but mostly with a more modern theme this time. I had already spotted the Technology Museum, set up in the former tram depot. It is a series of buildings with a variety of displays reflecting Krakow’s history as a centre of printing, science and technology. 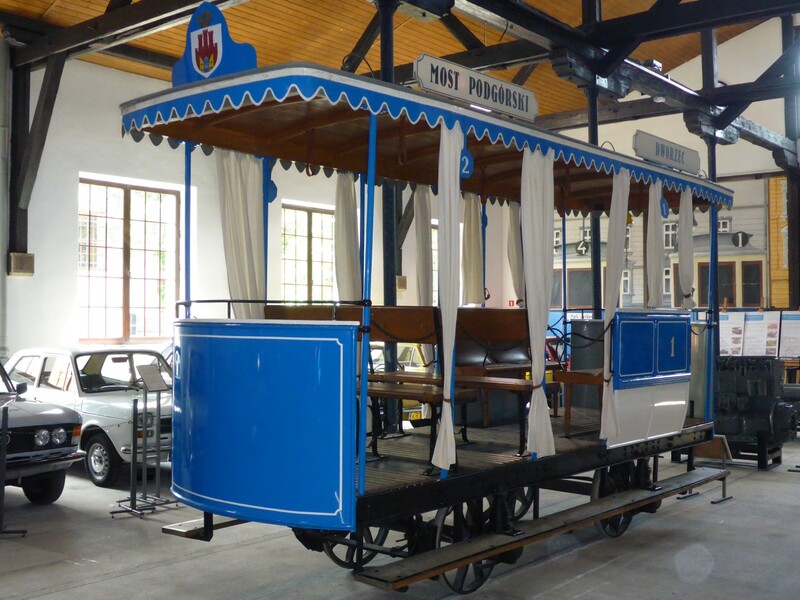 There are displays of printing presses – Krakow housed Poland’s first printing centre; a display of old trams and Krakow’s first motor bus, built on a wooden Chevrolet chassis; motorcycles, cars and trucks from Poland’s vehicle industry; a play and learn centre aimed at explaining mechanical principles to children. It didn’t take long to look around but was an interesting display and some exhibits brought back memories of breakdowns I had fixed. Polski FIAT anyone? 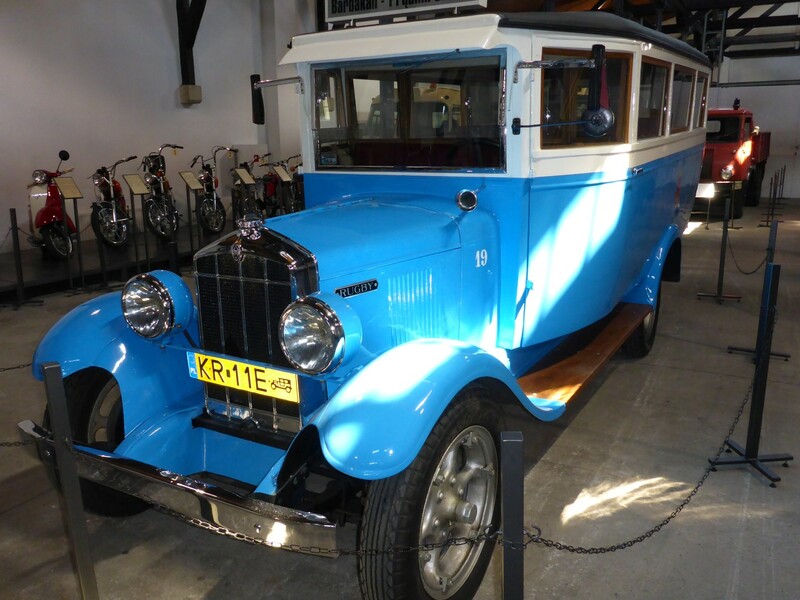 Chevrolet Motor Bus on wooden chassis. Lifespan of about three years. 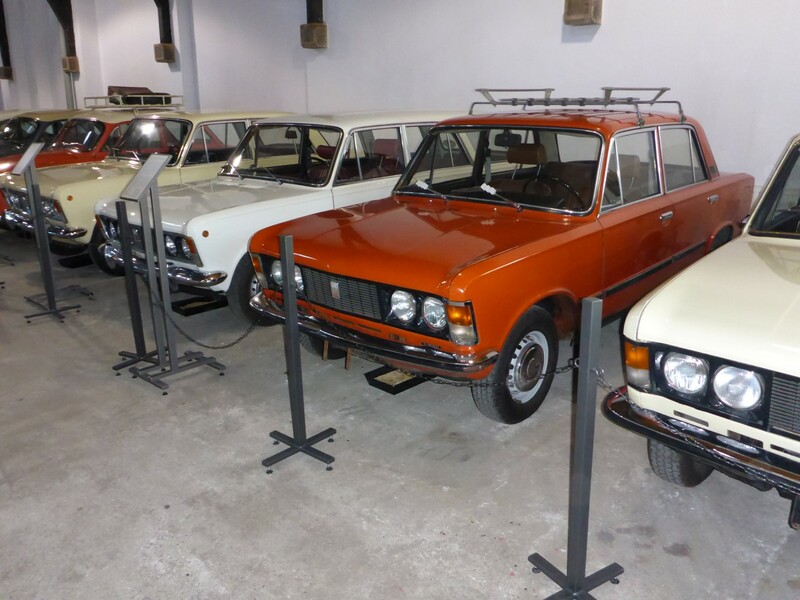 A selection of Polski Fiats. Enough to make me shudder. 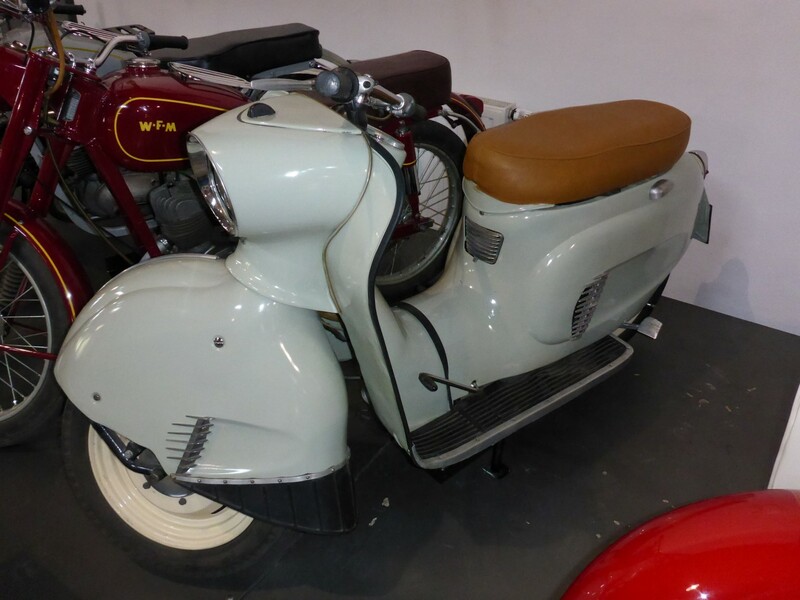 Rather strange motor scooter. All scooters are strange to me. That museum was on the edge of the old Jewish quarter, which is well worth a walk around. There is the 15th century Synagogue and several other Jewish buildings. They are slowly being used again, post communism, which is a good thing given the awful history of Krakow’s, and Poland’s, Jewish population. The area also contains many 18th and 19th century buildings reflecting the growth of the city outwards from the Old Town area. Some of them are a bit dilapidated and have graffiti on them, giving the area something of an edgy look. While I was on the more modern theme I went to visit the Manggha Museum dedicated to Japanese art, including photography. It was an interesting hour, with displays of costumes and masks used in the theatre and some excellent drawings. 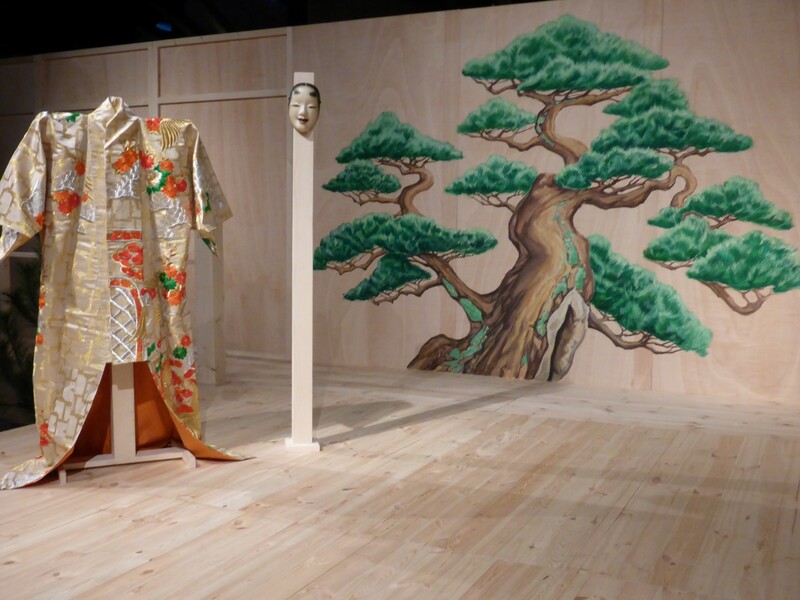 There was a display of masks as used in Japanese theatre and the captions taught me quite a bit about how Japanese theatre works. It was a lovely day outside so I walked along the river bank a while then headed back into the Old Town again for a last look around as I was leaving the next day. In the square there was a display celebrating the 25th anniversary of Poland’s first free elections, showing many items used by Solidarnosc in its successful campaign. Very fitting as I’d not long been to Gdansk. And there I had to leave it. 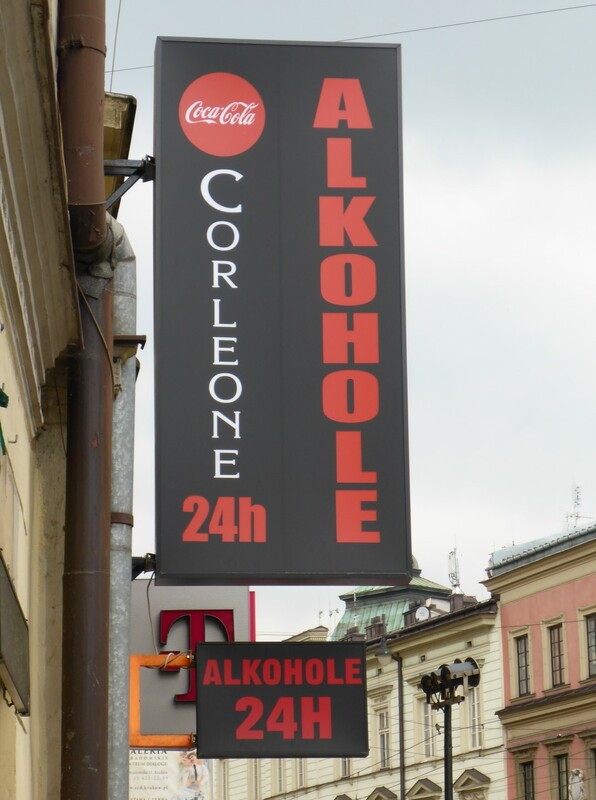 Despite spending four days in and around Krakow I knew I hadn’t seen all it had to offer. There are, apparently, over 600 sites to visit and sights to see. The city has a long history to explore, having been not only Poland’s capital but also its main centre of education, learning, art, literature and technology. With loads of great architecture to boot.I could easily have spent a week there. I know there are a few people who like to use my travelling tales as a ‘recommendation’ of where to visit (you know who you are!) so my advice is to take at least a week, maybe ten days and do the place justice. You won’t regret it. Another fantastic account of your travels. Thanks David. More to come soon.